I have been a Delta since December of 1978. The only sorority that I wanted to be affiliated with is Delta Sigma Theta Inc. And I would never even consider 100 years of celebration here in Washington, DC. This has been one of the best experiences of my life. It started when I picked up Jacquie Wyatt-Gray , my soror and charter member of Nu Alpha from the airport on Wednesday. Seeing her brought back all the memories of my college years. 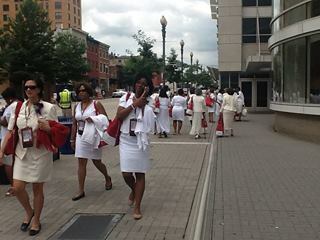 Observing all of the sorors converge on Washington making new memories was a WOW moment. While stepping onto Howard University's campus, every Delta we passed by said, "Hi Soror, where are you from," and the smiles were HUGE! As I scanned around to Quad, seeing all of that red and white, it was phenomenal. Tents were erected with the vendors selling their wares. The electricity was starting to build. I loved the feeling of sisterhood, a Kodak moment in front of our tree (DST) each fraternity/sorority had a tree. I wondered how many had gone before me. The building that housed the vendors was packed, hot, and of course a lot of fun. The vendors had every item of paraphernalia you could think of, and yes, we SHOPPED!!! There was a dedication ceremony by the "Stained Glass Window". One day we were treated to a tour of Delta's National Headquarters on New Hampshire Avenue. 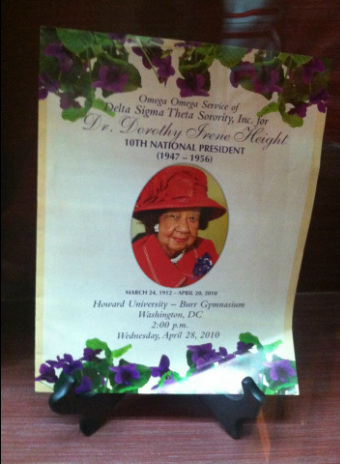 Thank you DC for changing the street name, the section where the headquarters sits, is now named, Delta Sigma Theta Way. Now how cool is that! Hand painted portraits of our founders, past national presidents, and esteemed figures of history that have shaped the organization were appropriately appointed throughout this historical building. There is a scale model of the Rose Bowl Parade Float, the first tribute to a national civil rights leader, Dorothy Height and many more snapshots of our history. At that point, I saw the impression that this tour had made on my great nieces face. You know that little spark that you get when there is an Ahh Ha moment. Yes, I want her to become a Delta! The day continued on to the reflecting pool in front of the Lincoln Memorial and the Washington Monument behind us for the welcoming ceremony. The program consisted of the Devine Nine presentation, the national Pan Hellenic Counsel of Greek Organizations with the lighting of the torch. Afterwards there was more entertainment for all. 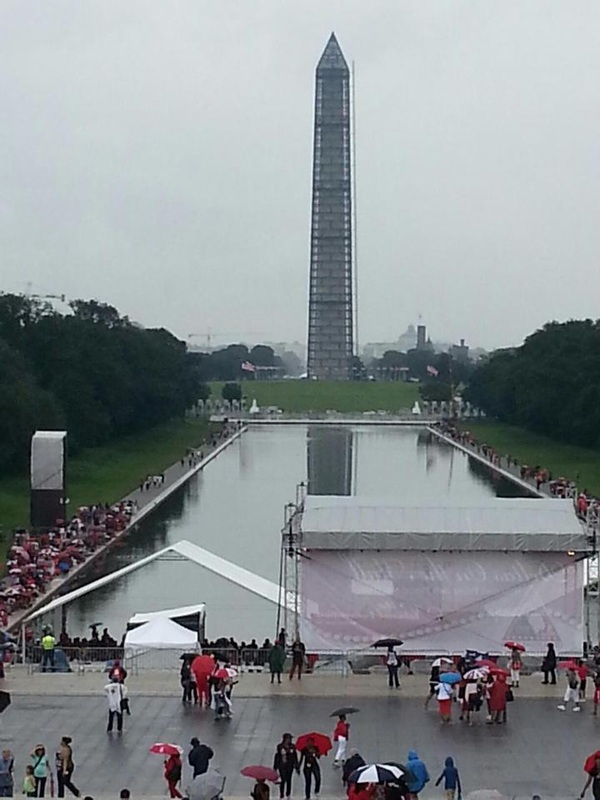 The reflecting pool revealed images of a sea of red, and the rain was amazing to watch. As the rain continued, nobody moved, the just put up their umbrellas and continued enjoying the ceremony. We met this amazing pastor from northern California who spoke about her many years as a Delta. She is a woman who the sorority reveres as a Delta Dear, precious gem of the sorority. She shared her experiences with pride and dignity as she relaxed on the waterfront. What stuck with me was how concerned she was about her neighborhood. She was concerned about the children, not wanting to lose the kids to the dope dealers, but the gang members did respect her. They were always welcome to her bible study and attended. This is a person who really cared about where she lived, and where the children who needed her. When many neighbors moved she remained. She stated that she always wanted to be a mentor, and a mentor who lived among the kids that needed her. When we parted, I told her that I am certain that I would see articles or special features regarding her life. The business of the Delta was strong and constantly ongoing. Members were extremely involved in the business at hand . Our vision is clear, tomorrow's work is a process, and the work at hand is important to secure our future as a strong organization. The sorority is going to be in good hands in the coming years long after I am a Delta Dear. All of the fraternities made sure that we painted the city RED . Everyday starting on Wednesday was covered by a party, brunch, lunch, dinner or of course a catered event. By the end of my event experiences, my feet needed a soaking party. I observed a lot of laughter, enjoying great food, rekindling of old relationships, the making of new ones, and the possibility of future Deltas. A family that prays together, stays together. Delta Sigma Theta has always stayed in prayer with their mission for staying in the vision of what our founders have wanted for this organization. I am so proud to be part of an international organization that focuses on so many aspects of service to the community where we live and work. May this excitement and elation of what I have seen over the past few days stay with us another 100 years and beyond. I LOVE MY DELTA SISTERS!